Oliver Waitze of the New Acoustic Gallery (NAG) in Wuppertal, Germany, announces that on 27 October 2013 two masters of New Acoustic Music, Mike Marshall and Darol Anger (USA), will be performing in concert at the NAG's new premises in Schloss Lüntenbeck, Lüntenbeck 1, 42327 Wuppertal. As founding members of the David Grisman Quintet and Tony Rice Unit in the 1970s, the Turtle Island String Quintet in the 1980s, the Modern Mandolin Quartet, Fiddlers 4, and Psychograss in the 1990s, mandolinist Mike Marshall and fiddler Darol Anger have been at the forefront of American stringband music since they met nearly forty years ago. 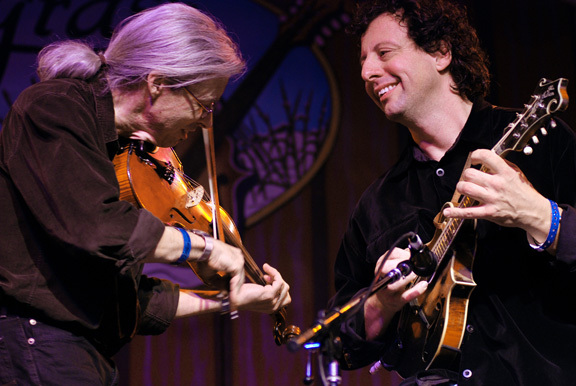 They were pioneers of the New Acoustic Music movement, which brought folk, jazz, bluegrass and world music influences together in an instrumental acoustic setting. Their joint album The Duo demonstrates their virtuosity, creativity and humor in a wide-ranging selection of breathtaking duets. This will be the duo's only appearance in Germany. The concert will begin at 19:30; tickets are €30. Only 75 seats are available, so early booking is advised.